We will arrest any government functionary behind attacks in Adamawa, Benue and Taraba state, Nigerian military warns – Royal Times of Nigeria. The Nigerian Army has warned it will arrest any government functionary that is behind the various attacks happening in Taraba, Benue and Adamawa state. The attention of the Nigerian Army has been drawn to the continued disturbing, senseless killings and wanton destruction of properties in Adamawa, Benue and Taraba States. In view of this, we strongly warn the perpetrators of these crimes to desist forthwith. 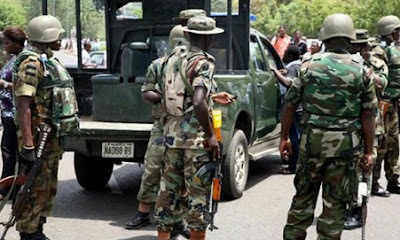 The Nigerian Army in conjunction with sister services and other security agencies are working assiduously to identify and arrest all those involved regardless of their disposition in the society including government functionaries. We would like to unequivocally reiterate that the Army Headquarters warns the arsonists and the killers to stop or face decisive action by troops. Our Rules of Engagement (ROE) is clear on arson and murder, therefore, no such criminal acts would be allowed in any of the aforementioned states. The public are please reminded that when troops are called out for internal security operations, they are not to joke or persuade anyone. We have warned our commanders on the ground to take decisive actions or face court martial. You are please requested to disseminate this information to the general public through your reputable medium.